Save $5.00 each month when you get set up on recurring billing!!! * Internet Storage Special, If You Found Us From the Internet Let Us Know to Get Your 3rd & 6th Month Free! Parking for vehicles, boats and trailers. 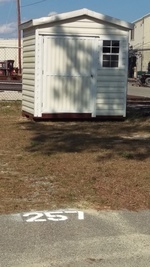 Outside Parking for vehicles, boats and trailers with 5' x 7' Covered Storage Shed. 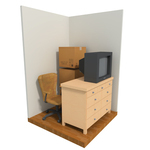 Several average rooms of furniture will usually fit. 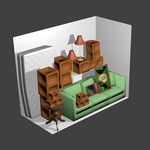 200sq.ft. 2000 cubic ft. and 8ft. wide roll up door. 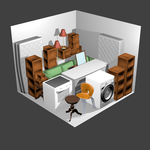 May store up to 4 or 5 rooms or a small car. 300sq.ft. 3000 cubic ft. and 8ft. wide roll up door. Will hold one moving van. A 40ft. moving van has only 2560 cubic ft.
390sq.ft. 3900 cubic ft. and two 8ft. wide roll up doors, one at each end. Holds a little more than a 40ft. moving van.